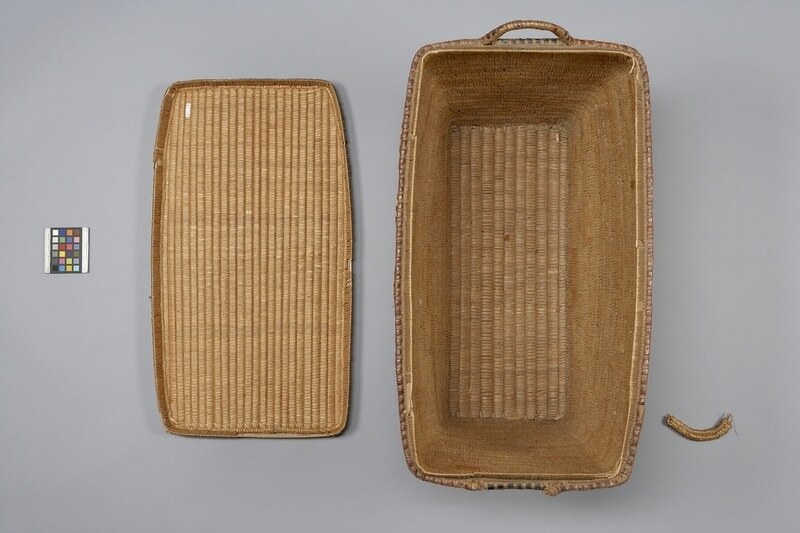 Rectangular basket (a) with rounded corners and a flat lid (b); lid is fitted flush to slightly flaring sides. Slat foundation of cedar joined together in split-stitched cedar root coiling. Sides decorated with imbrication resembling small rectangles which are placed in zigzag designs; there is a row each of red brown and black cherry bark flanking light yellow brown bark. Pattern horizontal on longest sides, vertical on ends. Other small design elements interspersed. Sturdy rim around base elevates basket. Imbricated and beaded upper basket edge in red brown cherry bark; lid with small loop handles, one at one end, the other, broken off (part c). Lid with beaded diamond patterns in red and black; faded. Base and top recessed rims are cracked and broken off. Those with lids commonly used for storage; others as cooking baskets. 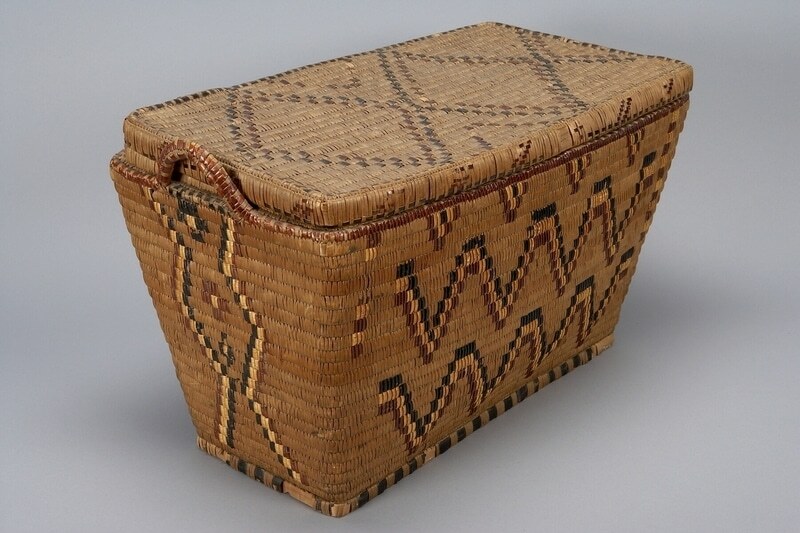 Basket makers from Mount Currie identified this basket as being from Skookumchuck, however they also stated that the design and weave are typical of work done in Mount Currie. 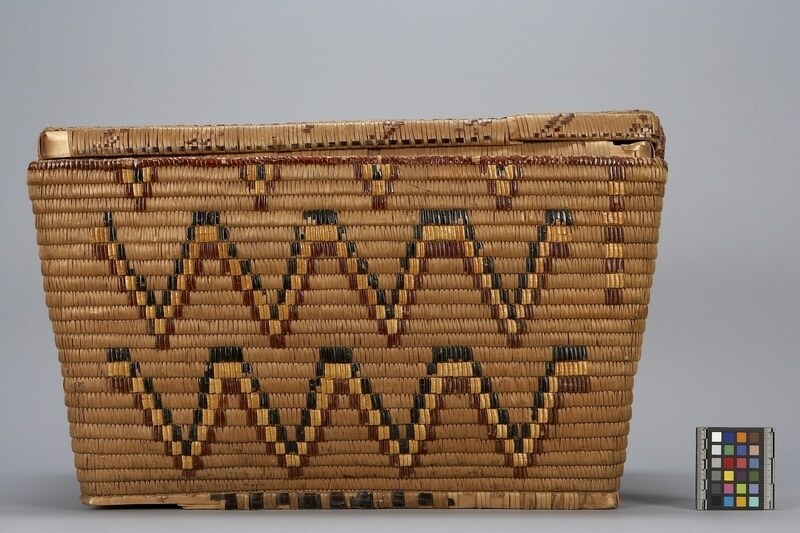 Imbrication is process of taking a strip of coloured grass or cherry bark and folding it under the stitching used to join the coils of the basket together. Common technique extends into Cascades region of Washington, Lower Fraser and Thompson Rivers, British Columbia. Foundation coil made of slats and/or bundles. Slats give basket uniformly flat surface, bundles give corrugated ridged appearance. Split-stitching wraps foundation by sewing into place on the row below with bone awl. Cherry bark is dyed black or bleached light yellow brown.